Join pineapple SF for a convo on the power, beauty and style of our spice cabinets ft. Sana Javeri Kadri, Carol Wang, and Preeti Mistry- 3 women with different philosophies on transforming the way we think about spice. Our moderator Hetal Vasavada, former MasterChef contestant and founder ofmilkandcardamom.com, will lead us in exploring what it’s like to start a company rooted in sustainable agriculture, and create a career around celebrating the origin of spice, and Preeti will lead a conversation about power, politics, and sovereignty around spices, followed by an exclusive spice blend demo. We'll end the night with more mingling, eating and a spice bazaar. Food is a great activator for us to connect and share with each other and develop and hone our voice. 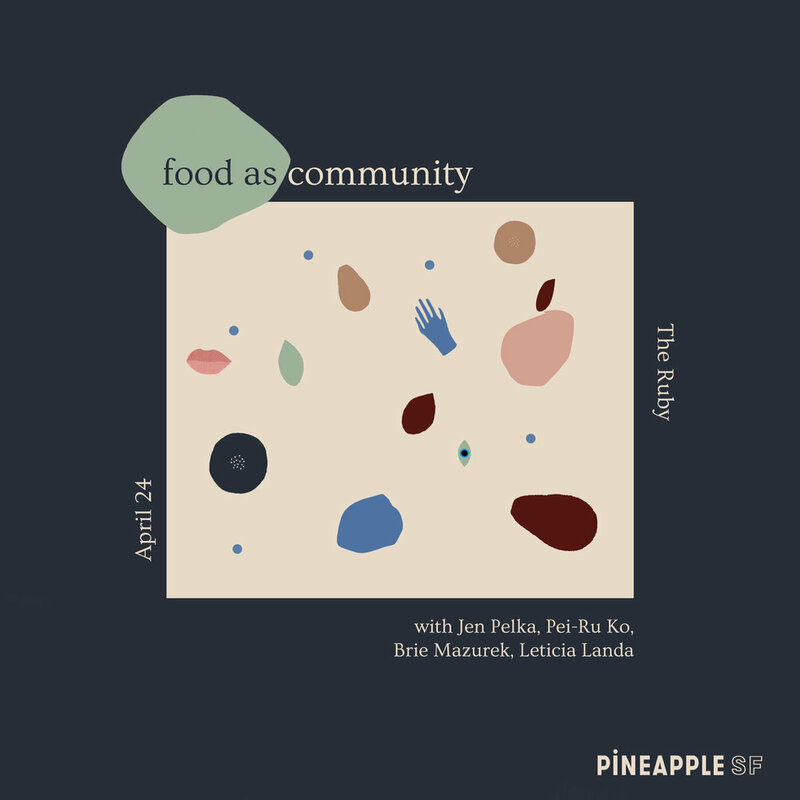 Our panel will dive into how food can create deeper ties to our communities. Featuring leaders who represent unique organizations and celebrated philosophies in the Bay Area, in a panel led by Rachel Kiichli (Community and Social Responsibility Manager at Bi Rite), we’ll hear from Amy Guittard, Head of Marketing and fifth generation owner of Guittard Chocolate, and Pei-Ru Ko, Storytelling Facilitator of Real Food Real Stories, and Leticia Landa, the Deputy Director of La Cocina. Join us for an evening of exploration & connection at The Ruby including a variety of tasty bites from our fave women-owned restaurants provided by Caviar and drinks from Health-Ade.